Bring LSCI Training to Your School or Organization! – Life Space Crisis Intervention, Inc.
Bring LSCI Training to Your School or Organization! 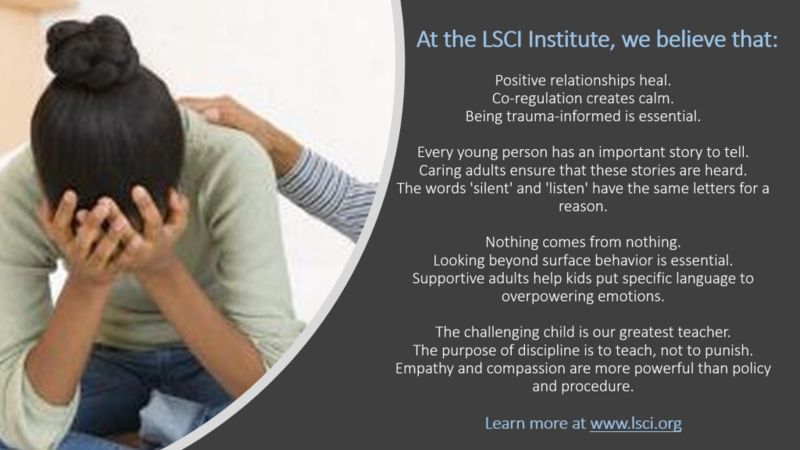 If you work in a school or organization that provides behavioral health services to kids and want to learn a non-physical intervention strategy for de-escalating problem situations and building positive relationships, the LSCI Institute will provide on-site training for your next professional development or in-service day! Email signewhitson@lsci.org or check out our list of Trainers/Training Sites to learn more. Additionally, the LSCI Institute offers online trainings, an 8-session Group Curriculum for Kids, and books written by LSCI trainers.